Take a load off and enjoy a 4-hour best of San Francisco sightseeing tour. On this private tour, you will be taken all around the city to see many famous landmarks, neighborhoods, vantage points of the Golden Gate Bridge and learn about this beautiful city as you go. With hotel pickup and drop-off included, you can take some the stress out of touring. Your guide will show and explain to you all these lovely sites and more, and end the tour with a stop for ice cream. 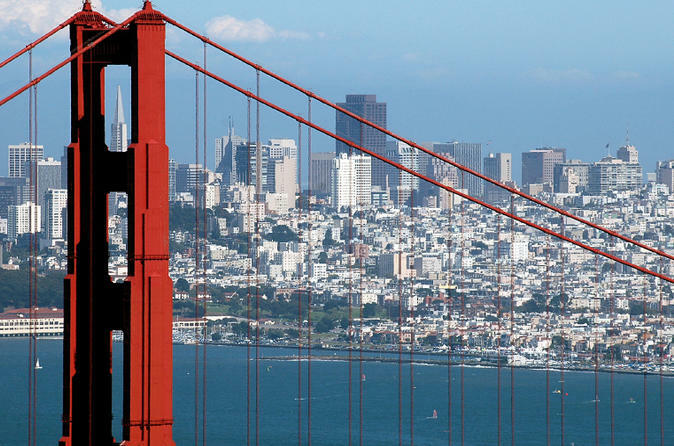 Start your private San Francisco highlights tour with hotel pickup. From there you will navigate to Lombard St. (a dramatic meandering downhill road that only cars are permitted to drive through). Next, visit the landmark Coit Tower and stop for photos. From there, head to Marina Green where some of the most expensive houses in the bay area are located. Here you will be able to enjoy the beautiful architecture. Up next you will drive over the world-famous Golden Gate Bridge and stop at the best location for photos. Next, make your way to Land's End, where you can explore the views of nature, and see the famous Cliff house. Ocean Beach is your next stop where you will smell the breeze from the tides of the Pacific Ocean. Next, see the Mosaic Steps and the best view of the Golden Gate Park, Ocean Beach and the Sunset District. On one of your last stops, you will visit Haight and Ashbury to take some pictures of this famous neighborhood. To end the tour, you can choose to buy some ice cream at Ben and Jerry's while you discuss your favorite sites of the day. After this, you will be dropped off back at your hotel.